Backwoods, boundary waters, blue highways — the GPSMAP 60 is your trusted guide to the great outdoors. The GPSMAP 60 along with the GPS 60 are packed with several of the features found in the 60 series color units, but sport an affordable, high-resolution, monochrome display for outdoor enthusiasts on a budget. Like the other products in the 60 series, this trusty handheld is compact and lightweight, with a user-friendly interface. It's reliable, and extra-precise as WAAS can make it. 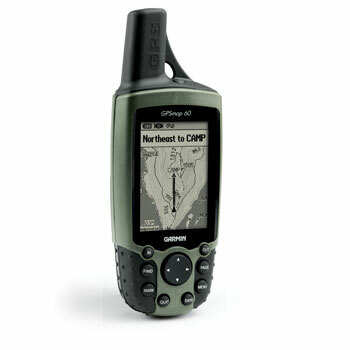 Special geocaching and geolocation gaming modes provide entertainment, as well as trailblazing navigation capability. The unit also includes an alarm clock, sunrise/sunset and moon phase tables, optimal hunting and fishing times — plus much more. Fully compatible with the entire line of MapSource products (see product compatibility table), the GPSMAP 60 makes it easy to navigate the great outdoors. Accepts data from MapSource products (City Select for driving, US Topo and 24K Topo for hiking, Recreation Lakes Fishing Hot Spots and Minnesota LakeMaster Maps for freshwater, and BlueChart for saltwater applications). We carry nearly all accessories. Email jollyann@cableone.net with inquiries. ** Denotes only sold with purchase of the GPS (or shipped with another accessory). *** AutoNav kit includes City Select North Americas CD, GPSMAP 60 auto mount kit, bean bag mount and cigarette lighter 12 volt adapter.